Today marks the first of a series of posts (I aim for them to be daily, but we’ll have to see how that works out…) aimed at improving style, one tip at a time. These are meant to be simple ideas that will cost little to nothing and generally involve a small tweak. I thought it would be fitting to devote the first Daily Tip to something I see all of the time when I’m walking around the financial district in Toronto everyday. Pants that are waaaay too long. This is one of the most common issues for men’s clothing today and is very easy to fix (anyone that can hem a pair of pants is perfectly qualified). I will explain I mean by hemming pants shorter in a minute; but first, I’ll explain a little bit about pants and why men are doing themselves no favours by wearing them too long. 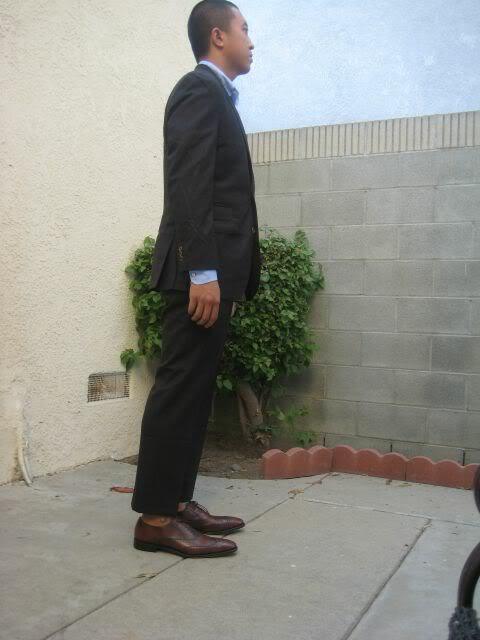 Suit pants are tailored. Meaning, they’re meant to follow the natural shape of your body and to present you in the best possible light. A tailor’s job is really to make you look as good as possible in what you have. When you buy a nice suit, generally the pants come unhemmed, meaning that the material is unfinished at the bottom of the legs. This is to allow you to have your pants hemmed to precisely the right length from the get-go. 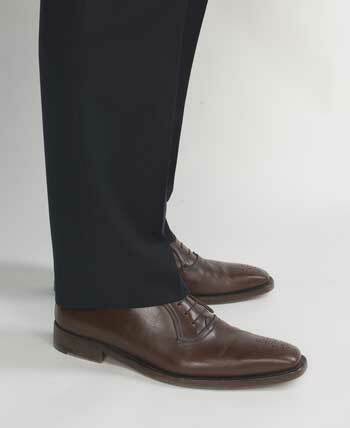 When pants hit your shoes, they “break”, meaning that they begin to pool at your feet. They no longer form a crisp line from top to bottom. The more material left at the bottom of the pant, the more “break” the pants have. In other words, my point is that men are wearing suit pants with too much break. Pants look best when they break once, and only once. In other words, they hit the top of your shoes in such a way as to cause the crisp line that has been pressed into your pants to break in once as you stand still. Often, this requires a tailor to hem the back of your pants (i.e. the part that hits the heel of your shoes) slightly longer than the front of your pants to provide for the shape of your shoes. You may ask why the break of one’s pants is an issue. First, it looks sloppy to have a lot of break (see picture on the right). Much of what makes a suit look finely tailored is to not have excess material hanging around that serves no purpose. Having substantial break is a very casual look, and while sometimes it can provide that slouchy-coolness to a pair of jeans, it completely clashes with the formality of a suit. Second, the modern trend is toward less break. Men’s clothing makers, most notably Thom Browne , have been cutting pants to more extreme lengths to the point where they have no break at all (see picture above, at left). I certainly wouldn’t recommend this look for most people (I want my lawyer, accountant, insurance broker and doctor to not be baring ankle in a suit), but it gives you an idea of where we’re at right now, stylewise. In the same way that having large shoulder pads in a suit makes it look dated, so does pants with a large break. Finally, a large break makes your legs look shorter. This is less of an issue for taller gentlemen, but generally speaking, don’t men not want to appear shorter? If you’re under 6′, I wouldn’t recommend cuffing your pants – having lots of break is effectively a more extreme version of a cuff. A long, unbroken line of pants creates the illusion of a longer leg – the shorter you are, the less break you should be requesting. So, when you get home from the office today, slip out of your suit, put on your favourite Friday night wear and prepare to down the weekend’s inaugural drink, look at your pants and assess whether you’re walking around with a slop of material on your shoes. If so, take the whole lot to your local tailor and have him or her sort them out. This shouldn’t cost much more than $10 a pair, but the improvement in your look will be immediate. Thanks for the tips and the pictures. It helped to see what you were talking about. Dear One Guy: Thank you for your excellent posts. I am so glad to see the one about the pants hems….all so true. Men’s clothes look so sloppy and ill fitted when the length is wrong. It drove me crazy when my sons, in high school, would bring home their rented tuxes for dances and the pants would be super long. I would duck tape them shorter (Best I can do….never could sew). I have actually been searching for years for a handbook just like your posts on mens stylings. I wanted to teach them the proper way of dressing and I know enough to know that there are many important subtleties to this….I just dont know what they all are. Keep your posts coming! Their friends are starting to marry, so next question I have are the ins and outs of formal wear: buying your first tux (and ways to enhance it through the years) and on tails, how far below the coat should the white vest hang? And which way is the cummerbund upside down (and how do you spell it? )What about shoes for a tux vs tails…I like the patent dancing slippers…also like the casual needle point slippers. Thanks! Please let me know if you’re looking for a writer for your blog. You have some really good posts and I think I would be a good asset. If you ever want to take some of the load off, I’d love to write some articles for your blog in exchange for a link back to mine. Greetings! I’ve been following your web site for a while now and finally got the bravery to go ahead and give you a shout out from Atascocita Tx! Just wanted to mention keep up the excellent work!